No parachutes–no planes–no tandem instructors–no certifications. When you fly in the wind tunnel, it’s so much simpler than all that: you simply lean forward into the wind from a door on the side of a glass cylinder and just simply fly. When you arrive at a wind tunnel to try indoor skydiving for the first time, you’re given the hands-on instruction, equipment, and qualified assistance to make human fight your reality. If you’re ready to join the ranks of tunnel flyers, don’t hesitate: you’re going to love it. Here are a few indoor skydiving tips to help smooth your way. 1. Not a Thrill Ride. 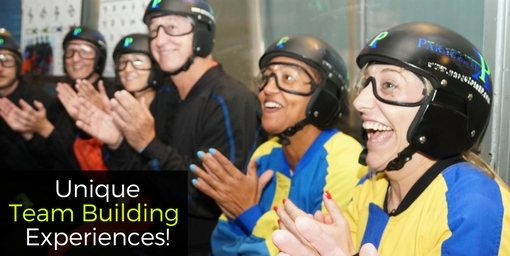 Indoor skydiving is no roller-coaster thrill ride. Instead, each flyer is in control of his/her own experience. You can expect your instructor to work with you throughout your flight, demonstrating and helping you to control your body in the airflow. You’ll be rewarded with a surprisingly intellectual, proprioceptive experience that’s as challenging and rewarding as it is fun. It’s no wonder people fall in love with it as a sport! 2. Indoor Skydiving Safety Restrictions. At Paraclete XP, we routinely welcome guests as young as three years old! There is no upper age limit, so bring the whole family. Our only restrictions are based on general fitness and health. We do require that guests are not pregnant, have not had issues with prior shoulder dislocation, are not wearing a cast, are not under the influence of drugs or alcohol and do not have a history of neck, back, or heart conditions. We require that potential flyers who weigh over 250 lbs. give us a call to discuss the booking. Paraclete XP strongly suggests making a reservation in advance to make sure you have the very best experience when you arrive at our facility. A reservation guarantees availability on the day you wish to fly (and significantly reduces your wait time, too). To check on availability, head over to our online reservations. Oh: and it’s important to arrive at least 45 minutes prior to your flight time! If it’s your first time in the wind tunnel, we encourage you to choose a package that includes video of your flight. You’re going to want to remember your first experience, even if you end up hanging out with us on the regular! For extra footage, bring a friend to post in our observation area to snag photos and video while you’re in the tunnel. When you rock up to Paraclete XP on the day of your flight, you’ll go through a check-in process. While you’re waiting for your session, you will have some time to observe other flyers before your “ground school” class begins. Make sure to pay attention, as watching others will give you a clearer idea of how the process works. Once your instructor calls you in for your classroom instruction, it’s all systems go. The classroom portion will prepare you for the nitty-gritty of your flight experience, from tunnel exit and entry to body position to in-tunnel communication. You’ll watch your instructor and demonstrate your skills before you put it in the tube. After your class, your instructor will help you to gear up in our charming Paraclete XP flight suits, helmets, goggles, and earplugs. Insider tip: It’s a great idea to bring whatever you can to control your hair situation. Bands, buffs, bandanas, bobby pins–the closer you can get your hair to your head, the better! Tunnel wind loves to tangle your tresses. You’re going to love this part. Flying in the wind tunnel is a unique, almost other-worldly experience! If you relax and pay close attention to your instructor, you’re going to be thrilled by how quickly and easily you take to the air. Have a great flight!